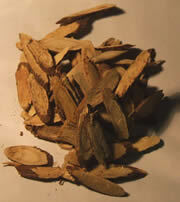 Licorice root is a plant that is primarily grown in Europe. Licorice is a natural sweetener. Due to being naturally sweet, licorice has all sorts of various uses. Licorice is heavily used in candy, obviously. But less obviously, it is found in such exotic things as root beer and is put into many medicines...the sweet and strong taste helps disquise the nasty taste of the medicine. And, of course, licorice finds its way into various herbal teas. While all teas are not created the same way out of licorice, by and large, teas that contain licorice in them are likely to be rather sweet. The sweetness will really hit home in the after-taste, where the taste just lingers on and on and on. Listed on this page are links to reviews on this site for teas that have a licorice taste to them, or at least should. Click on any of the links to read the full review.